My Nguyen is the creator of the popular healthy recipe blog Myhealthydish.com with large social media following of a million healthy foodies on Instagram. My’s on a mission is to prove to the world that eating healthy food can be easy and delicious. Her first cookbook called “My Healthy Dish” which will be on the shelf April 19th, 2016. Her original photos and recipes have been so sought after that she has landed campaigns with top brands like Jamba Juice, Hallmark, Panasonic, McCormicks, Campbells and many more. She is in the process of developing her second cookbook and masterminding her third. There are also plans for a My Healthy Dish App coming in 2017. To her “It’s a Lifestyle, Not a Diet.” She currently resides in Brentwood CA with her husband and twin girls. What I do best is not just cooking, but reinventing how we look at healthy food and cooking it in a way that are drool worthy. I may make it look easy, but it’s actually very complex. I keep in mind the average person who doesn’t cook often and is unsure on what healthy food is. I use ingredients that we are all familiar with or can at least identify and use cooking methods that are simple. I’m the best at what I do because not only can I transform healthy food into delicious simple recipes, but also I make I also make it beautiful to look at. Food styling and food photography is what has set me apart from other health food bloggers. Where they focus on the nutrition of there dishes, I show more. I want my food to be nutritious, taste delicious, look appetizing and is visual artistic. Or what I call Food Art. Our viewers cannot actually taste our food until they make it, but in order for them to make it. They actually have to like what they see first. I have daily, weekly, monthly, yearly and lifetime goals. To set only lifetime goals like buy a house you don’t get that instant gratification of accomplishment. I have goals set in play all day, like writing for 30 minutes a day or waking up before 7am to prioritize my day. All my goals lead up to the bigger picture, which is what I aspire to be. To one day have a self-sustaining business and have My Healthy Dish a household name. My biggest personal success is my twin’s girls Shayna and Kiera. Being a mom is the most challenging and rewarding job I’ve ever had. Watching them grow up to be compassionate intelligent young woman is my biggest personal success. 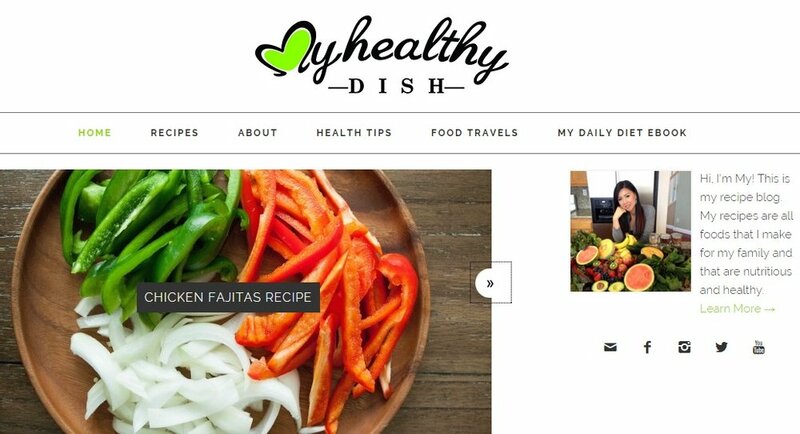 My biggest professional success is growing my Instagram account @myhealthydish_ to one million followers, which has lead to my first cookbook “My Healthy Dish” on the shelf April 19th 2016. I feel if you’re going to be an entrepreneur that you’re wiling to take a lot of risk. It’s almost like gambling with your time and money and hoping that there will be a big return on your investment. The hardest part for me was taking that risk to the unknown. I put in the work to develop My Healthy Dish, not knowing where it would lead. I struggled everyday questioning if I was doing the right thing when I should be working a job that paid. Especially with the mountain of debt we were accruing with only my husband working. I told myself I had to try or else live with regret. Not everything I did worked and it was always discouraging when it didn’t, but I learned from each mistake. My favorite Motto is something I say to my followers a lot. “It’s a Lifestyle, Not a Diet.” I want my followers to know that diets are very restrictive and only last temporarily. They should obtain healthy habits that are reasonable and attainable. So it’s ok to have pizza once in a while, just not everyday. I’m obsessed with Rachel Ray. She was who taught me how to cook in college when I didn’t even know how to make eggs. I watched her show “30 minute meals” religiously and coincidently most of my recipes take about 30 minutes to make. Hands down Maui. I visit there so often, I should be a local. It’s where I go to unplug and recharge. After finishing my first cookbook I am now putting all my efforts into having my own cooking show. I’m in the process of meeting producers that best align with my vision and I hope by the end of this year we will have a solid show to debut.